Sic transit gloria mundi. Four drawings by Raphael Vella. The title of a series of ten drawings called ‘HOMeS’ by Raphael Vella is a neologism. First of all it refers to Homs, Syria’s third largest and one of its oldest cities. During the still ongoing Syrian war, it was besieged for three years, from 2011 to 2014, a fate which Homs has suffered of during multiple battles since the middle-ages. The second meaning of the title HOMeS obviously refers to any building used as a home. The motives of the pencil drawings were taken from Syrian war press photos. Their individual titles resemble catch words of real-estate for sale advertisements, though we are immediately stopped in our thoughts by looking at the drawings themselves. They are of a war-torn cityscape in ruins, houses abandoned by the people, streets deserted. On closer look we realize that, snugly nestled within the ruins of this ghost town, in each drawing there stands but one pristine building, an icon of 20th century Western modernist architecture, barely visible within the surrounding chaos. They are four renowned houses designed by Le Corbusier, Gerrit Rietveld, Louis Kahn, and Eileen Gray all of which seem to either have been dropped from the sky above and landed amidst the ruins -or they might have miraculously been saved from the total destruction around them. We feel unsettled (pun intended), not knowing how to interpret this combination, or rather fusion of construction and destruction, if you will schism between perfection and decay. The lines below the drawings are matter-of-fact descriptions of some of the buildings’ qualities; again they could have been taken from real-estate ads, emphasizing our confusion of how to interpret the images’ meaning. 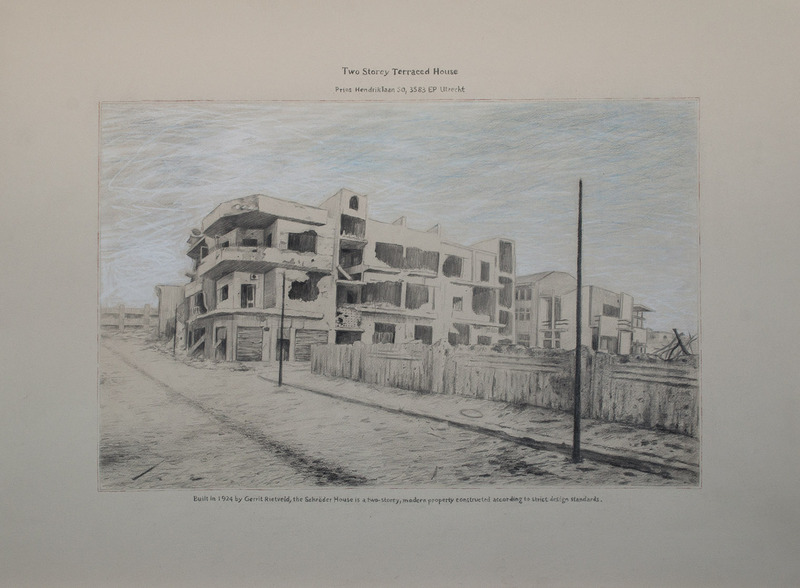 By composing a wide frame of reference, Vella decontextualizes modernist buildings of famous European architects by integrating them in images depicting the total destruction of a once prosperous Syrian city. Through this combination of harmony versus chaos,life versus death the artist – in a subversive, subtle way – places the results of war’s horror into the front garden of those countries responsible for this tragedy. He creates a morality tale for the viewer. Do the drawings not make us feel ambivalent? About mourning the destruction of cities which goes hand in hand with all wars or maybe about the possibility of their reconstruction which in this case is symbolized by the modernist houses still standing tall, rising like Phoenix out of the ashes? Do the drawings evoke a certain voyeuristic fascination for ruins as was common in European culture during the eighteenth century? Do they depict the Janus head of the monster of war, of all wars, the eternal cycle of destruction and reconstruction? When changing one letter in the word HOMeS we get the word HOPeS, but the outlook seems to definitely be pessimistic. May we also, within a different, cultural context, interpret the choice of these four particular HOMeS as a reference to the defeat of modernism, its concepts, hopes, and dreams, a cultural battle lost? This series of drawings by Raphael Vella is a quiet, non-propagandistic way of making a historical, political, and social anti-war statement all-in-one within an art context. War and peace have symbolically met in one and the same image – WAR though is overpowering peace to the nth degree.